Looking for some creature comforts to take a ‘5 minute rest’ or two, perhaps to have a picnic while out on the O’Keefe Rail Trail? Over the past 4 weeks, users of the O’Keefe Rail Trail may have noted some additional facilities, like new table and seat units with bike racks that have been installed at two locations adjacent to the trail. These trail facilities have just not magically appeared, it is not something that “Oh, ho hum, eer..suppose the council has done that!” type situation. Not at all!! With the assistance of two community grants and the installation efforts by some passionate volunteers from the Friends of the Bendigo-Kilmore Rail Trail, these trail user facilities have been completed with little fuss. 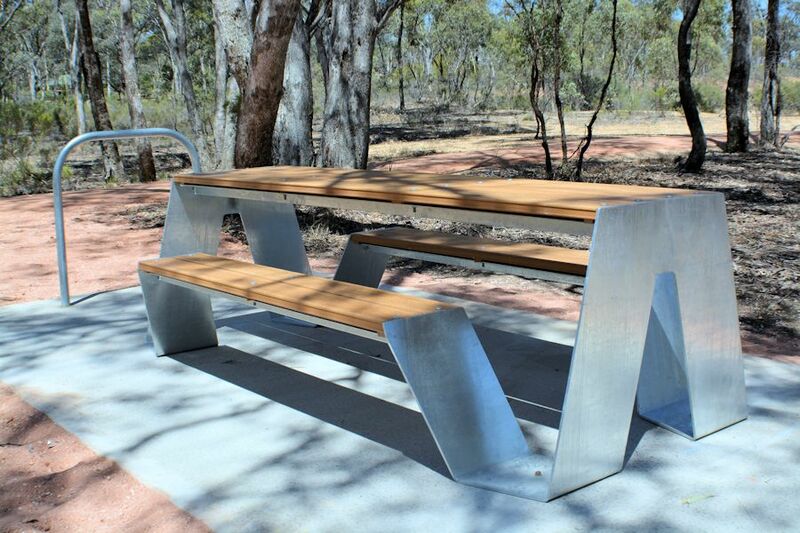 Just near native trees and bushland, a meandering water race nearby delivering much needed water, with views of the former railway branch line ‘roads’ that went to the Commonwealth Ammunition Storage facility and the separate branch line to the associated Ammunition Proving Range, one new table with single seat unit plus its concrete pad and two bike racks have been installed. These are near the former ‘Rangelea’ Station, just off Atlas Rd Junortoun, and this outcome has been made possible with the assistance of a $1500 community grant from CVGT Australia, creating a restful place while out enjoying the trail. A double table with two seats plus concrete pad and two bike racks have also been installed at the former Strathfieldsaye Station site, just off Wilkie Rd Junortoun. This was as a result of the support from the Strathfieldsaye & Districts Community Enterprise, who provided a $4995 community grant towards the project. While the former Strathfieldsaye Station was originally built in 1888, quite some distance from the actual Strathfieldsaye community centre, the station’s life turned out to be the shortest of all the railway stations before being closed to traffic. Yet small reminders of the past can still be seen close to the new trail rest stop in the Junortoun Flora and Fauna Reserve.